This all happened on Friday, the day of preparation, the day before the Sabbath. As evening approached, an honoured member of the high council, Joseph from Arimathea (who was waiting for the Kingdom of God to come), gathered his courage and went to Pilate to ask for Jesus’ body. Pilate couldn’t believe that Jesus was already dead, so he called for the Roman military officer [Centurion] in charge and asked him. The officer confirmed the fact, and Pilate told Joseph he could have the body. Mark 15:33 informs us that Jesus died, ‘at the ninth hour’, which in Hebrew time keeping is 3 o’clock in the afternoon. So this scene is set after that time. Since evening was approaching, it must have been some time before 6pm, which in Jewish time keeping is the end of the present day & the beginning of the next. perhaps it is about 4 pm in the afternoon. The sun is starting to descend towards the horizon & has lost it’s brilliance in this scene. From left to right, Roman Centurion, Pontius Pilate & Joseph of Arimathea. The Roman Centurion & Pontius Pilate I have drawn before, so I simply used the skin tones & uniform colouring I have used in previous scenes for them. Joseph from Arimathea is a new character, previously undrawn. I wanted to make his clothing a bit grander, since he is described as ‘an honoured member of the high council (Sanhedrin)’, & so I’ve drawn him in purple colours, with a rather fetching purple turban! 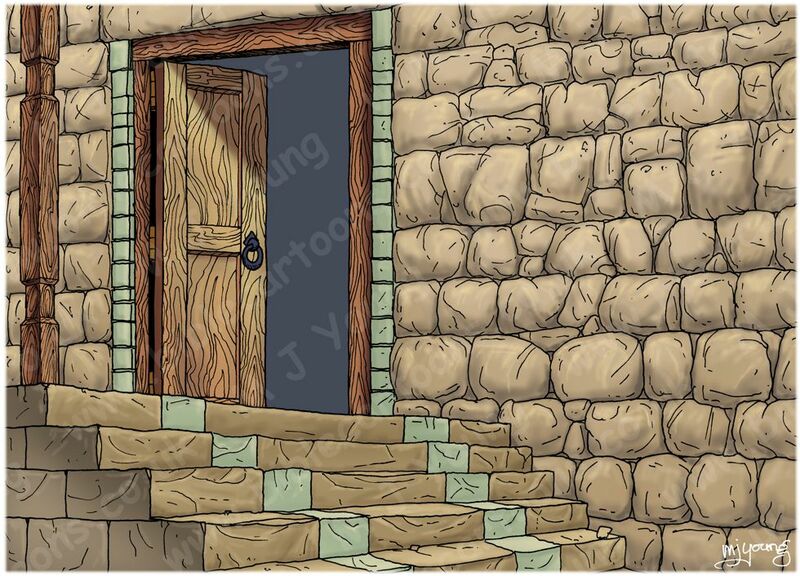 Notice that Joseph is on the steps of Pilate’s residence in this scene. 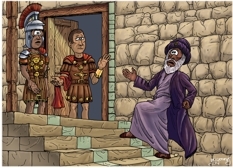 The Jews believed they would be defiled if they went inside a gentile (non-Jew) house, that’s why Pilate & the Centurion are on the stone veranda outside Pilate’s residence. 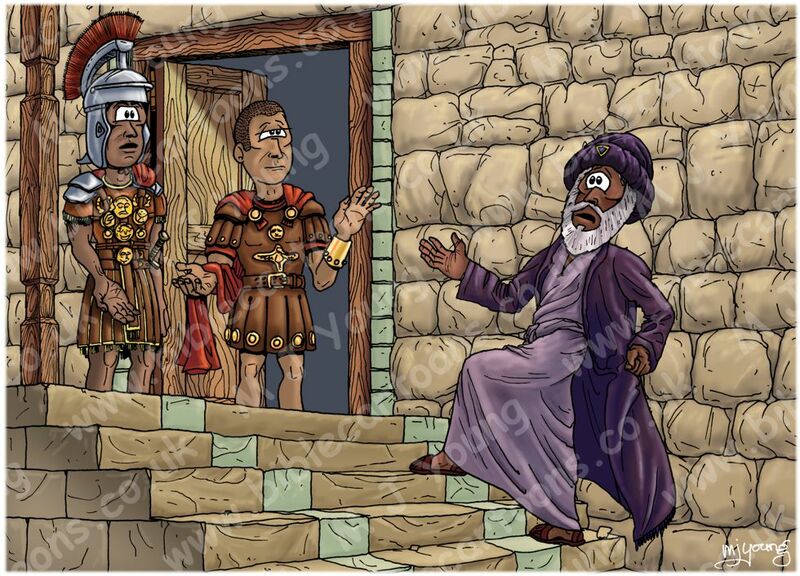 The Roman Centurion is explaining to Pilate that Jesus has indeed died. Joseph is standing on the steps, beseeching Pilate for the body of Jesus. Notice that Pilate is looking a bit pompous, & is raising his hand to dismiss Joseph by agreeing to give Jesus’ body to him. Here’s what the scene looks like without the figures. A note about Jewish time & time-keeping. A new day began, in Jewish thinking, at sundown (about 6pm) & lasted 24 hours until 6pm the following day. The Sabbath thus began at sundown on Friday (called Preparation Day) & ended at sundown on Saturday (the Jewish Sabbath). A new week thus started at 6pm on Sunday evening. Jesus died about 3 hours before sundown on (Good) Friday, which was Preparation Day, ie preparation for the Sabbath. It was against Jewish law to do physical work or to travel on the Sabbath, so any preparation for the Sabbath had to be completed by 6pm on the day Jesus died. It was also against Jewish law to allow a dead body to remain exposed to view after 6pm (see Deuteronomy 21:23), which explains the urgency of Joseph from Arimathea’s actions: he only had a few hours before sunset & the Sabbath began. Verse 44-45 outlines the exchange between Joseph of Arimathea & Pontius Pilate, regarding Jesus’ body. Verse 44 tells of Pilate’s surprise at the speed of Jesus death. It seems he didn’t believe that Jesus had already died, so he summoned the Centurion who oversaw Jesus’ execution, & listen to his report (verse 45), confirming the fact. It is interesting to note that Mark alone recorded Pilate’s questioning of the Centurion; this detail might have been included by Mark to show his Roman readers that Jesus’ death had been verified by a Roman military officer, so that no-one later could deny the fact that Jesus actually had died. There is a so-called “swoon theory” which grew up some time after the death of Jesus, which suggested that he didn’t really die on the cross at all. Mark’s note about the exchange between Pilate & the Centurion establishes that Jesus REALLY did die. No officer in the Roman military machine (so expertly trained in execution) could make such a basic error, & it was often the case that if an intended victim of execution survived, then the lives of the execution party would be forfeit. That would certainly give them sufficient motivation to be absolutely certain of Jesus demise! The courage of Joseph from Arimathea. John 19:38 informs us that Joseph from Arimathea was a secret disciple of Jesus, as was probably true of Nicodemus. (a) He was not related to Jesus, usually only relatives of the deceased could do that. (b) His request was a favour which he might expect to be denied since Jesus had been executed for treason. © He risked ceremonial defilement if he handling a dead body (see Leviticus 21:1). (d) His request could be seen an open confession of personal loyalty to, or discipleship of, Jesus. That would set his associates in the Sanhedrin against him. At that point Joseph from Arimathea was a secret disciple no more, something Mark expressed in order to impress on his readers.